The popularity of apartment living in Australia is evident. And high density living has become a necessity. The major cities in Australia are bursting, and the population growth won't come to a standstill. All states and territories recorded a population growth in 2016 with Victoria showing the highest growth rate at 2.4 per cent, followed by the Australian Capital Territory (1.7 per cent), New South Wales and Queensland with 1.5 per cent each. Sydney hit the five-million mark in April last year. More and more people choose an urban lifestyle close to amenities, infrastructure, and transport, Driving through Sydney, it is hard not to pass a construction site announcing the next lot of apartments available off-the-plan. 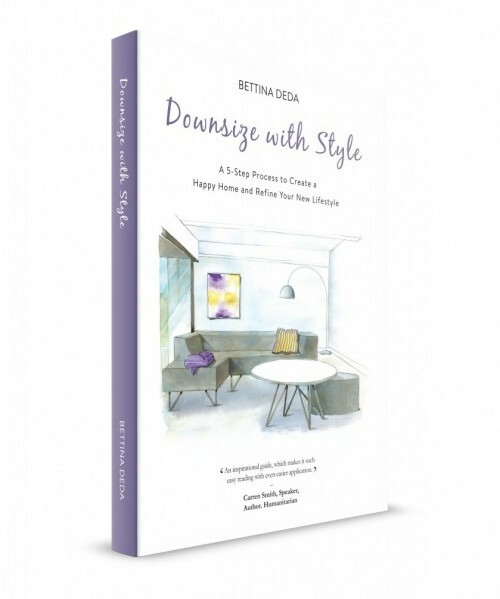 It's now a year ago that I launched the Downsize with Style online course for empty nesters planning to downsize their home and for people who are already living in apartments and would like to learn my 5-step process to living with less and achieving a stylish and functional home in a more compact space. Everyone learns differently, and therefore I am offering this online course where people have the opportunity to dip in and out as often as they like. There is no timeframe, and everyone sets their own rules. 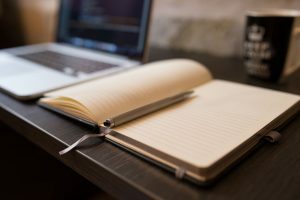 The beauty of online courses is that one can revisit a topic as often as one likes. People can listen to the audio files when and where they prefer. 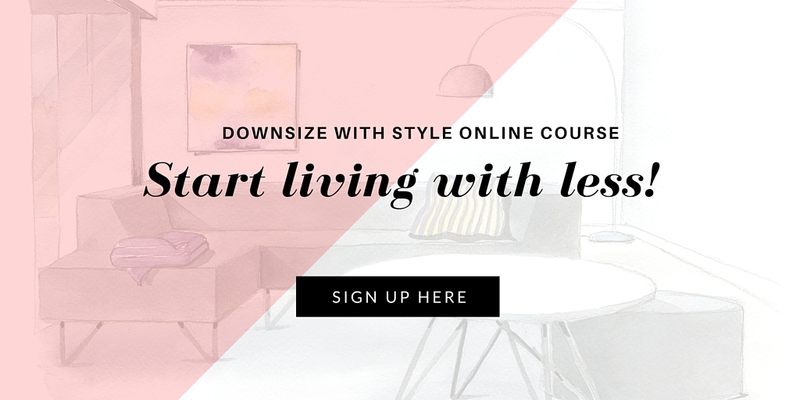 Downsize with Style is a self-paced learning course where all of the course materials – consisting of fiive modules including audio files, slide presentations, handouts and other resources – will be provided at the time of booking to complete at everyone's pace. After each module, students will find a list of action steps to keep them focused and on track. Additionally, there are links for further reading and checklists and worksheets to download referring to the content in the module. Module 3 is all about visualising your decorating ideas and includes brand new content about mood boards, including the components of a mood board, the process of curating a mood board and seven steps to consider when creating your board. Start living with less and sign up today! 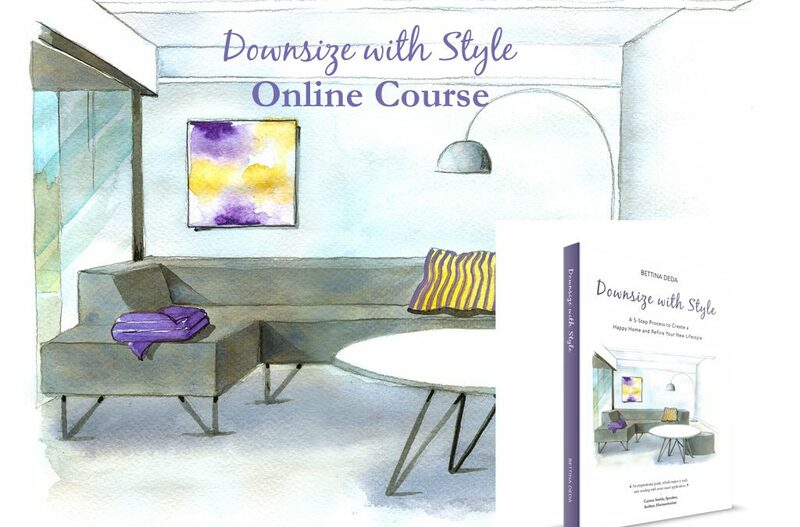 The Downsize with Style online course is wonderful. We have just moved from our huge family home to a much smaller townhouse. The course helped me every step of the way, from the initial planning, through de-cluttering excess stuff, to space planning and decorating the new home. Downsize with Style has helped me identify my own style, I am no longer looking for styles to copy, but finding inspiration from many places and things, and finally feeling confident to style my home with things that I love. The space planning I learnt from the course was fantastic, helping me see what furniture and items we would keep and what to sell or donate before our move. On moving day, I was able to direct things exactly to where we had planned which made things so much easier. We are on a fairly tight budget, and with the space planning I was able to see ahead of time what items I would need to get in the future. I know exactly the shelving unit and size I want to get for our small hallway and am saving for it now. We are getting our new sofa delivered today and know exactly where it will fit thanks to the space planning Bettina taught me. We have just moved in and still have boxes to unpack but so far I am really enjoying living in our much smaller home. I'm so glad we downsized now and can enjoy our home. I highly recommend this online course as well as Bettina's book and joining her Facebook group. She has lots of great podcasts you can listen to too! Yes, I want to simplify my life!